Monument signs are meant to serve as statement pieces outside of country clubs, churches, office buildings, apartment complexes and many other buildings. 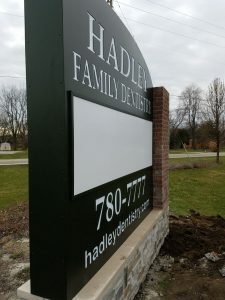 They may only feature the name of an establishment or business and little else, but outdoor monument signs are a noticeable fixture that will get people’s attention and tell them everything they need to know about a company. Commercial monument signs can include a mix of architectural designs and are often very large. It’s why many business signs, city and state welcome signs, church signs and more are often monument signs. By installing outdoor monument signs, you can put your business on the map and make sure no one misses your sign and your business when they drive or walk by your establishment. Learn more about monument signs online or call Greenfield Signs & Lighting today to discuss your ideas with our team. Call 866-740-9797 or email phil@greenfieldsigns.com today and see how we can help your business.